Good morning all my bloggie friends. HAPPY MONDAY to you all. For this challenge I created this whimsical card for a friend. I love the colors and design. What say you? inspiration and join in the fun. Great card!! Love the CAS design!!! Beautiful! I love the covered brads! Such a beautiful card! Happy colors! Where did you get the Beautiful brads? Love them!!! Very nice. Thank you so much for joining us at Craftin Desert Divas “Anything Goes“ Linky Party. Beautiful card! The flowers are so pretty and love the brads in the center:) The touch of pearls in the corner are awesome! Fun challenge! Love the scalloped boarded. The detail you added with the buttons for the center of the flowers just finished the card along with the pearls along the bottom. 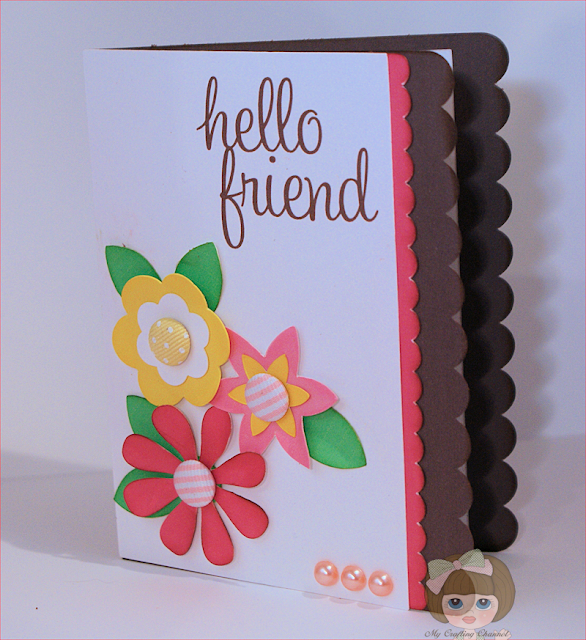 Great job, thank you for linking up with Craftin' Desert Divas.